This year, I completed my third #MOOC course called 'Learning How to Learn: Powerful mental tools to help you master tough subjects'. This course is offered by University of California, San Diego through Coursera and is taught by Dr. Barbara Oakley, Prof of Engineering at Oakland University and Dr. Terrence Sejnowski, Francis Crick Prof at the Salk Institute for Biological Studies. Through this post, I want to reflect on my experience with the course and what I learned about learning. One of the highlights for me was the discussion around the use of the Pomodoro technique. I knew about this time management technique using a 25-minute timer but hadn't used it in a while. I really enjoyed applying the technique to some of the projects I was working on at the time and I am happy to report that I was able to work much more effectively. But this technique may not be for everyone. Try it to find out if it works for you. My favorite theme from the course was 'What is learning' and within that learning how and when to use focused versus diffused modes of thinking. In the course, Dr. Oakley highlights how an interplay between these two modes is a crucial aspect of learning. Focused mode of thinking is where we purposely focus on and use our attention and concentration on what we are learning. I think of it as a strobe light highlighting only one character on the stage so all my brain energy is focused on that single character. Diffused mode of thinking is where we learn when our mind wanders. In this mode, there is nothing specific we are focusing on and our brain is in a relaxed state. I think of it as a situation when the stage lights are dim so I can't really see any particular actor or prop and my brain is free to think of something that's more big picture or something that's unrelated. In this state, my unconscious mind is connecting the dots that I did not connect previously. Working in the diffused mode is what explains how you have an answer to a problem you were struggling with, right when you wake up in the morning. Sleeping on it really works! This is how Dr. Oakley describes these modes using the pinball metaphor. Although we need to work in both these modes to learn anything, you cannot be in the focused and diffused mode at the same time. However, you can move from one to another and bring some of the big picture thinking, problem-solving ideas and insights from the diffused mode into the focused mode. Here's how some creative people like Salvador Dali and Thomas Edison moved from one mode to the other. It is darn interesting to read about how they switched their attention! I am still working on the best technique for me to move from one mode to the other. I have found that during my morning walks, I am more or less in a diffused mode and I do tend to get some great ideas on how to solve problems. I don't necessarily carry a notepad to write the ideas down! So, I am now trying to record small audio snippets of some of the brightest moments and will see how that goes. Happy learning! Every Thursday at 5:30 PM PST, a bunch of folks get together on twitter and chat about all things learning in our weekly #lrnchat @lrnchat. #lrnchat started in 2009 and this is what we are all about. 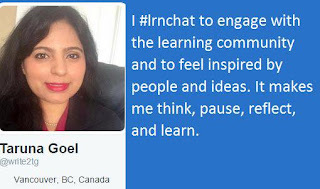 There are several reasons why I #lrnchat. But if I had to sum it up in a single word, I'd say I #lrnchat to ENGAGE. I engage with the topic of conversation. The topics are things we may find ourselves thinking about but there are not enough platforms to talk and discuss our ideas. I have always found something of interest and the topics are always things that matter to learning and performance. I engage with others when discussing the topic. Any topic is only as good as who is chatting about it. Every time I #lrnchat, I find myself in the company of people who are passionate about learning and performance. People from all parts of the globe join in. Although twitter restricts us to use 140 characters, these folks say so much more. The conversations produce relevant content and resonant ideas and thoughts that stay with me much after the chat. Some participants are industry veterans and others are newbies. But in the #lrnchat room, everyone is treated as equal and welcomed and encouraged by the moderators along the way. I can't say that we all always agree about the topic. But the beauty of such a chat is that when I interact with people who are different from me, there is an opportunity for me to gain new perspectives and start thinking 'differently'. It is a way of reducing and eliminating my filters. And I value that a lot. The connections that I have made and the ideas that we continue to exchange, have helped me solve problems, inspired me to do things differently at work and led me to go back and pursue some of my childhood interests and hobbies. See who participates in #lrnchat. I engage with myself and discover more about myself and my views. - What makes you an expert? - What did you learn today? - Instructional Problem: What would I do in this situation? #lrnchat often forces me to think deeply about things that I haven't thought about much. I have read more articles, blogs and books because I want to learn more about the topic and form an opinion of my own. All this learning and reflection leaves me refreshed and energized. But it is not all serious. The chat is sprinkled with funny anecdotes, silly remarks, entertaining pictures and interesting personalities. This is the fastest hour of my week and I love it! We often hear and read about how to become an expert, a guru, a specialist, etc. But no one ever talks about how to be an amateur. Maybe because the word 'amateur' makes us think of someone who is inexperienced, unskilled, unprofessional so there is nothing appealing in becoming one. When I heard the NPR radio podcast titled 'Amateur Hour', it intrigued me. This podcast/video cast is all about speakers sharing their stories of 'plunging - or being plunged into new situations and emerging as experts'. The focus of the conversation is all about jumping in and figuring it out. But the real reason that the idea of being an amateur fascinates me is all about what the word actually means. The word amateur is derived from the French word, amateur, meaning “lover of" and from Latin amatorem nom. amator, meaning "lover". So, to be an amateur means to love what you do. And that's how I want to feel about everything I want to do. I want to be in love with what I am doing! I really enjoyed listening to all the speakers but Taylor Wilson - 21 years old applied nuclear physicist - the most 'amateur' of them all, shared the real deal about why it is good to be an amateur. He said, “I think that, you know, people who have, you know, spent their professional careers in a field sometimes get bent to those preconceptions or the way things are done. And I think that young people don't necessarily develop those preconceptions, and so they just go out and do. And, you know, I didn't really know that, you know, this wasn't the way things were done, or, I wasn't convinced this is the way they should be done." As an amateur, we don't have too many preconceptions and biases because we don't know any better. But when we become seasoned professionals and experts, sometimes we set limitations to our own mind. This morning, in a different podcast on how to find work you love, the speaker, Scott Dinsmore said, "Everything is impossible until someone else does it." And I truly believe we are what we think. Our imagination and limitless thinking can take us anywhere we want to be. So, I want to think like an amateur and let go of my preconceptions about what's possible and what's not. I don't know about you but when I am trying to learn something new, something challenging, something I haven't done before, I have a different type of energy and passion towards learning, experimentation and failure. Every failure fuels my determination. I also find myself striving for smaller successes along the way and enjoying these accomplishments instead of waiting to celebrate the achievement of the final goal. As an amateur, I try and surround myself with people who know and do what I am trying to learn to do. And all that good company is inspiring and transformational. When I am in the company of people who are better at what I am trying to do, I am not concerned about the final outcome as much as the process of learning. I just want to absorb like a sponge. I find that my entire perspective and mindset as an amateur is very different from when I am wearing the 'expert' cap. As an expert, I am preoccupied with the thoughts of expectations, targets, success and failure. Someone is always looking up to me for workable ideas and proven solutions and I am way more critical of myself. But as an amateur, I have nothing to lose and everything to gain, so my mind is free; to make mistakes and learn from them. But don't get me wrong. Experts have a huge place in this world and there is much to learn from their mindset. Besides, if there are no experts, who will the amateurs learn from! 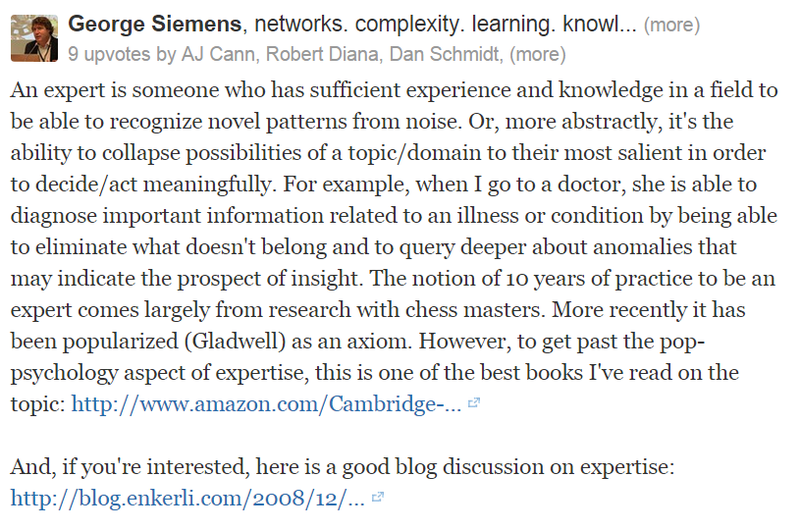 (If you get a chance, do read my post on what makes you an expert for a synthesis of different ideas about expertise.) But what I truly appreciate is the eagerness and the dare devil attitude of an amateur. Yes, there are special joys of being an amateur. But if you are an expert, just try and think like an amateur before you tackle the next challenge to see if it makes any difference. I think it will. Edmond Hillary should know. He was very articulate in saying: "I think the really good mountaineer is the man with the technical ability of the professional and with the enthusiasm and freshness of approach of the amateur." In his book, The 7 Habits of Highly Effective People, Stephen Covey talks about the concept of the Maturity Continuum. He discusses seven habits that are designed to help individuals move from Dependence to Independence (Self-Mastery) to Interdependence (the highest level of maturity). While the book is designed for individuals to become more effective in their personal lives, the ideas translate well into all aspects of life. I have been thinking about how these ideas can influence the design of learning and our role as learning consultants. Internet and easy access to information is changing the role of a learning designer. The advancements in the social and technological environment of learning are redefining what we must do. There is still a need for identifying learning gaps and providing the right solutions but the solutions are not necessarily in the form of courses. Whether we embrace it or not, learners are more in control of their learning than ever before and learning is becoming more social and personalized. I don't think we are 'designing' learning in the strict sense of design anymore. Instead, I find myself acting more like a consultant who is facilitating the process of learning and working towards delivering performance. From creating learners who are highly dependent, I am moving towards a role where my relationship with my learners is transforming into interdependence. In the act of consulting and designing learning experiences, I want to encourage learners to take responsibility for their own learning and guide them as they find the solutions to their performance problems. In this environment, I see my role as a facilitator of the process of learning and not necessarily the provider of information or knowledge. I see myself as the seed for learning conversations through which I can enable my learners to connect with other learners, their peers, and experts in their personal learning network. In that sense, I am a node in the learning path; and hopefully a critical one. I see myself as the one that connects learners and creates opportunities for interaction and engagement. There is a greater need for content curation and presenting information in the context of learning and performance. There is a need for identifying the right learning and performance metrics and gathering evidence in support of performance improvement. There is a need for becoming an agent for change. The way I look at it, my goal as a learning consultant is to help learners move along their maturity continuum and help them define and follow their path from dependence to interdependence. My take on the #Blimage Challenge: Learning is A-Mazing! I jumped into the #blimage challenge. Although no one challenged me to it, it was too much fun to ignore! 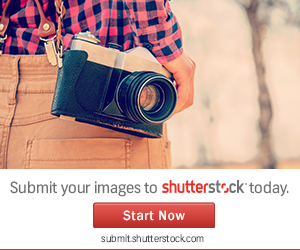 #Blimage means 'Blog' and 'Image'. It all started with one tweet and has since become so much more. The co-conspirators are Steve Wheeler (@timbuckteeth), Amy Burvall (@amyburvall) and Simon Ensor (@sensor63). My inspiration for this post came from the image shared by Clark Quinn in his response to the #blimage challenge where he wrote about how learning can flourish in the right culture. When I looked at this image, it spoke to me instantly. What is a maze? an intricate network of winding pathways with one or more blind alleys and is usually designed as a puzzle...but this also defines what learning means to me and how I think about learning experiences. Mazes and learning have a much more deeper connection. Infact, it was after building a maze that Tolmon and Honzik were able to discover latent learning in rats and brought forward the cognitive view of learning. Also, learning and mazes is not limited to rats. Honey bees have been known to navigate different types of mazes and learn the navigation structure to improve their performance. For us humans, mazes and labyrinths have a deep history that cuts across various subjects including architecture, mythology, astrology, sociology, psychology and many other subjects. The history of mazes goes all the way back to the 5th century BC when the first maze was discovered, the Egyptian Labyrinth, by Herodotus, a Greek traveler and writer. But what makes this image interesting to me is the similarity between mazes and learning - or atleast the way I see it. 1) Multiple Paths - There are always many paths to learning. Some are obvious and others are waiting to be discovered. Some are short, others are long winding. While it looks predictable, more often than not it can be quite erratic. 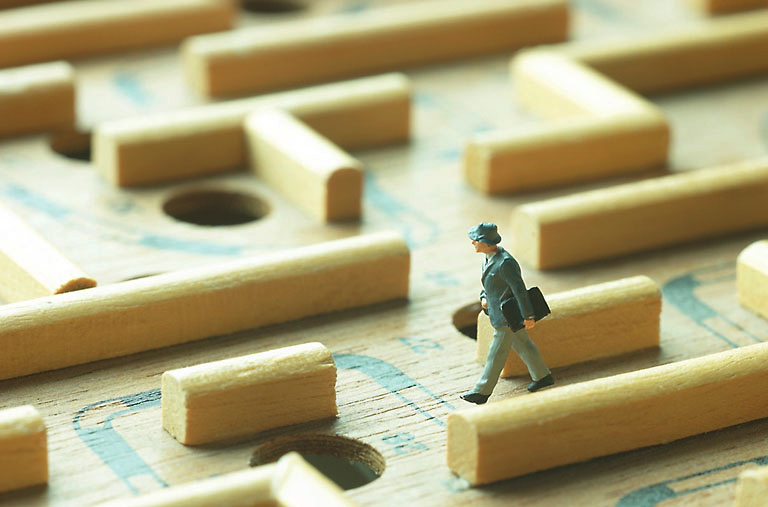 There are unexpected twists and turns in the journey of trying to solve a maze just like there are serendipitous learning moments in our own personal journeys. 2) Structure and Chaos - Paths, walls and hedges provide a structure to the maze. It may seem chaotic, but there is a plan and there is a well-thought out design underlying the construction of the maze. In the absence of the hedges or walls, it is tough to solve a maze. Similarly, it is tough to learn anything in vacuum. A learning goal and good instructional design provides the necessary structure and motivation and a way forward to continue. Learning may seem chaotic but underneath the layers, there is usually a solid design that provides the necessary structure. 3) Mix of Challenge and Fun - Sometimes a maze can be fun and at other times it can be very challenging and deeply reflective. There are deep holes to avoid and mental blocks to leap over. Learning is pretty much the same. 4) Learning by Doing - In a maze, the act of doing something and taking a step is, in itself, is a cause for learning. Trial and error is the only way to crack the maze and solve the puzzle. Similarly, one cannot learn by staying at the edge of the scenario and the possible experience. One needs to get in there, get the hands dirty, learn by doing and by making mistakes. 5) Personal Accountability - Just like a maze has to be traveled and experienced individually, like it shows in this image, so does a learning journey. One has to feel responsible and take accountability for one's own learning. Others can offer tips and share their stories but one has to walk the maze independently. this better than a maze. If it was all about simply solving the puzzle, one would jump the hedges and break the walls. But anyone who has stepped into a maze knows better. The journey of walking through the maze is far more important and eventful than reaching the end. Learning is pretty much the same. It is an ongoing journey to self discovery. Hope you enjoyed this post. I certainly had fun writing it! For those who are interested, Simon has created a pinterest page as a way to organize all the images that have been used in the #blimage challenge and you can explore the blog posts inspired by the images. 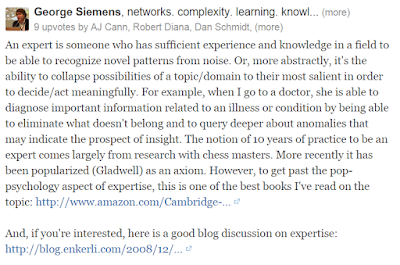 David Kelly has curated the same information but tagged as an alphabetical list of blog posts by authors. Steve is also collating all posts tagged as #blimage. How Serendipitous Discoveries Make Great Learning Stories! But here it is, as I wrote it on my facebook wall with the accompanying picture. My elder sister and family have recently moved to Vancouver and this weekend, they finally got their hands on their car! Since it is a big car, we all decided to head out and make the most of the sunny day. We decided to visit Lynn Valley Suspension Park. But seems we were not the only ones! We went in circles for about an hour trying to look for a parking spot but ultimately did not find one. 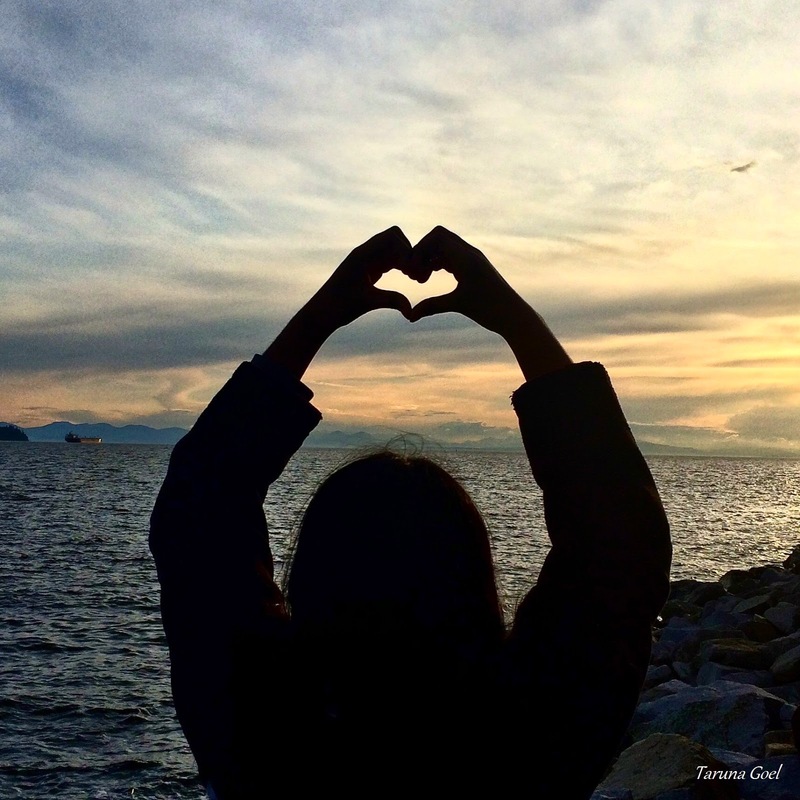 With a packed picnic basket, we made our way to Ambleside beach. After a quick bite, we decided to walk up to the pier and stand at our usual spot. And under my fingers I felt something on the wooden plank. It was an earring. Not just any earring. I believed it was my lost earring that I didn't know I had lost at Ambleside! And we haven't been to the pier since April or maybe March. So, there it was...a serendipitous discovery of what was once a part of me and my life...just sitting there, waiting for me. My family was amused at what just happened. Let me say they 'respectfully' did not believe it was my long lost earring. All reasoning was...well logical. I mean, it had been more than 4 months and I didn't even remember if I wore it then or several months before that. And many others would/could have the same pair. And yes, all the rains and all the hands and all the crab fishing ropes and nets did not dislodge this earring from the wooden plank. But logic apart, I 'knew' it was my earring. In fact, I had bought this pair for my daughter while I was on a business trip to Ghana, Africa. I had thought it was light-enough for her small ears and it matched perfectly with a necklace. But how I came upon it yesterday, was shocking, amusing and so humbling. We started out for a different place and for some reason, we did not find a parking spot at Lynn. Then, we almost decided not to walk to the pier. We all actually did come back to the car but could not resist being at Ambleside and not walking up to the pier. But more importantly, of all the spots, and the seven of us who were standing on that particular side, I had to go stand right 'there' with my hand on top of the earring. If any of the others would have found it, it would mean nothing to them. But somehow, I was to find it. Anyways, I couldn't believe it and took a picture and kept the earring in my pocket. I always keep the other halves of my lost earrings safely. Because... you never know. So, we came home and I started looking for the other half. I did not find it in the usual places. I kept thinking about it all night. And in the morning, I just knew where to look for the other one. And there they are. Finally, a pair. Together again. Some things are just meant to be together and the universe conspires to bring them back together against all odds, logic and reasoning. 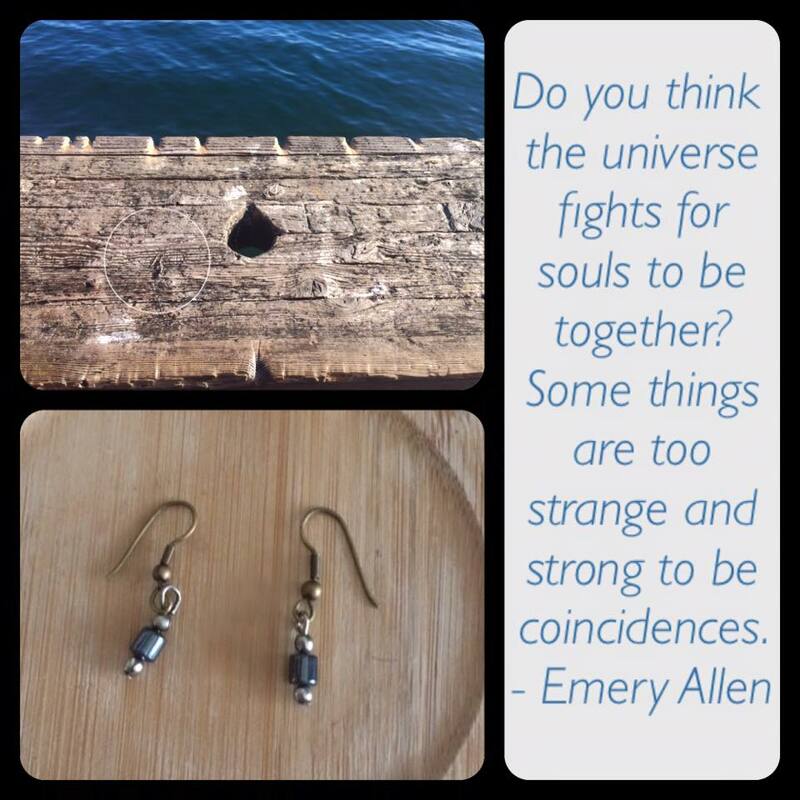 The term, Serendipity means a "fortunate happenstance" or "pleasant surprise". Although it is one of the ten English words hardest to translate in other languages (as per Wikipedia), we have all had our tryst with serendipity. I am fascinated by the word 'serendipitous'. It sounds beautiful...almost magical. As a learning designer, I first came across the words 'serendipitous learning' back in 2011 via Jane Hart's blog. I was quickly drawn to this aspect of learning as it was so different from my usual logical, organized, structured and analytical bent of mind. Later, I read a paper by Ilona Buchem about twitter and microblogging as serendipitous learning spaces. More recently, I read Jane Bozarth's column here and how, as instructional designers, we can create and support serendipitous learning. But here's the fun part. To me, this is what real serendipitous learning is all about. After I made the discovery and shared it with my friends and family, I was overwhelmed by their likes and comments on the post! My story ran home with a few people who had perhaps made similar discoveries in their life and had a story to share. In less than 24 hours, I saw 70+ likes and read beautiful comments... and the 'likes' and comments continue to pour in as I type this post. Now, for the 'real' serendipitous learning out of an equally serendipitous discovery. This incident and the experience really made me think. I was wondering if we could do something to become more serendipitous in life and cause more of such chance encounters that have a happy or beneficial consequences. What makes us serendipitous learners and discoverers? We could not find a parking spot to save our lives that day. We were disappointed and frustrated. After we got over the anger, we all huddled and decided to go somewhere else and do something completely different from our original idea. There was no suspension bridges to cross in the new plan - but we were now looking forward to a picnic on the beach! We gave chance a chance and that allowed and enabled serendipity to happen. Although some people refer to such series of events and chance encounters as luck, I would think that serendipity is more about being observant. An inquisitive mind that remains curious to know and to find out more is more likely to make serendipitous discoveries. Louis Pasteur said, “In the fields of observation, chance favors only the prepared mind.” My fingers felt something on that plank and I decided to find out more. If I had dismissed what I observed and felt as something trivial or uninteresting, you would not be reading this post today and there would have been nothing for me to learn.
" I would define serendipity as the art of appreciating a new possibility when you come across it unexpectedly, the willingness to veer from your projected path and take one you never thought of. Serendipity is particularly valuable when things, inevitably, do not turn out as you wished. At such moments, if you are a serendipitist (a word that James Joyce coined in 1939, in Finnegans Wake), you discover that the new possibilities before you are in fact more useful than what you had intended to do, that what you found turns out to be better than what you were looking for." PS: I also learned that the word 'serendipity' comes from Serendip, an old name for Ceylon (modern Sri Lanka), from Arabic Sarandib, from Sanskrit Simhaladvipa "Dwelling-Place-of-Lions Island." On 28th of January, 1754, Horace Walpole coined the term 'serendipity' in a letter, referring to a fairy tale called 'The Three Princes of Serendip'. These princes 'were always making discoveries by accidents and sagacity, of things they were not in quest of'. For the past several months, I have been a part of a project team where we are designing and developing a Career Map and Self-Assessment Tool for the Mining Industry Human Resources Council (MiHR), Canada. When we started our work with the client, one of the team members, Nigel Llyod, suggested that we call ourselves the “MiHR CATS (Career map and self-Assessment Tool)”. That's when my tryst with meerkats began. If you haven't seen a meerkat before, it is a furry little animal that belongs to the mongoose family. They live in all parts of the Kalahari Desert and in South Africa and are very social animals. Just like meerkats, we are all working together in a group as a part of the project. We also have a sentry (aka our Project Manager) who keeps track of everything in our project. And like meerkats that dig burrows for food and survival and live in underground networks with multiple entrances, we are digging into the mining industry and trying to uncover various careers in mining in Canada and how these tunnels of competencies connect with each other. 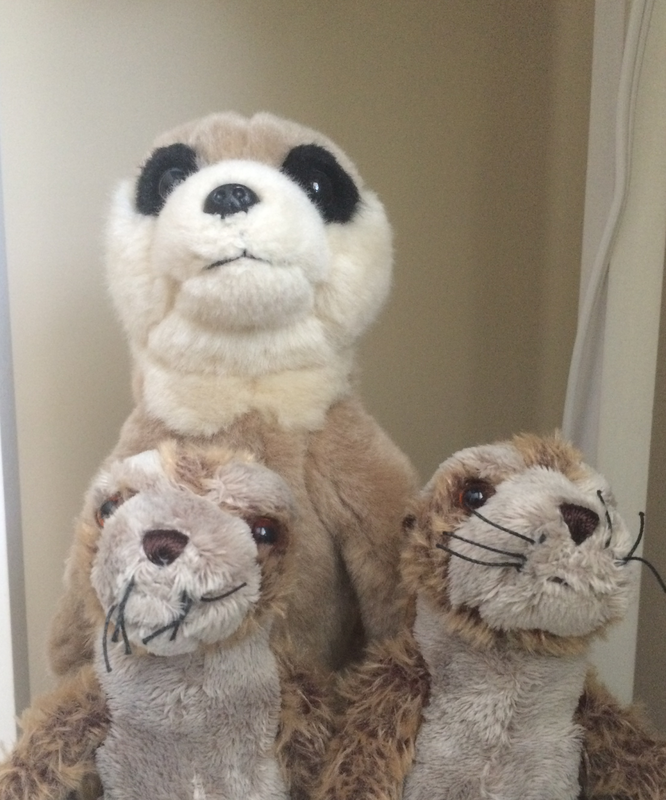 So, meerkats have become the symbol of our project team and our client addresses us as the MiHR CATS! The same evening, after we had named ourselves, I stumbled upon the television series 'Nature of Things' that profiled a meerkat family. This started my journey to discover more about meerkats. If you haven't watched the documentary series 'Meerkat Manor', you must watch it! (See here) The leading actors of this show were a part of experiments conducted by Thornton and coworker Katherine McAuliffe to see if meerkats show some form of teaching. On this journey, there were many fascinating things that I learned about meerkats. But as a learning experience designer, what really stood out for me was that meerkats are natural teachers. And I was curious to know how they did it. While most other animal pups learn by observation, meerkat pups learn by practicing and by doing in addition to observation. Meerkat adults engage in active instruction and create opportunities for pups to learn. So here's how they do it! The most favorite food for meerkats is the venomous scorpion. Meerkats are immune to some types of poison but the stingers can still cause considerable damage. So, before they eat their prey, meerkats bite off the scorpion's stinger to disable any attack. The helper meerkat (also called the demonstrator aka the teacher), brings food to the young pups based on their begging calls. To start the foraging lesson, young pups are given dead scorpions to eat. As the young pups grow more mature, the helper meerkat brings in live scorpions with the stingers removed. Once the pups learn to bite off the scorpion's stinger, the helper meerkat brings in live scorpion with stingers and all. All learning is done in phases and the lessons vary according to the age of the pups where the prey changes from being dead, to being injured (or disabled) and finally to live scorpions. The pups are given opportunities to practice their skills and move from incompetence to becoming competent hunters. There is feedback involved. If the pups aren't able to hold on to the live prey, helpers bring it back and nudge and encourage the pups to try again. The pups learn by observation and acquire key information from the adult helper meerkat and then apply what they learn to eventually catch their own prey one day. It may seem simple, but meerkats apply many learning principles better than we humans do! Active learning: The learning is focused on solving a problem that of finding food and survival. It is a real problem and the teacher meerkat shows how it is done and creates opportunities for the pups to learn. Competency-based learning: Although not explicitly based on the 'theory of mind'; helpers respond according to the type of begging calls. The way we'd understand this as instructional designers is that tasks are tailored according to the competency level of the pups and are organized in increasing levels of difficulty. Learning by doing: The pups get opportunities to practice what they learn and apply their learning in real-life tasks. Learning as a two-way process: Young meerkats 'pull' key information from the adult helper. At the right time, the helper meerkat 'pushes' feedback to help pups learn. So, that's how meerkats do it. And so do ants. There are possibly many other animals that 'teach' their young. As we look at identifying newer and more innovative approaches to learning, it is important that we make the connections back to how nature does it and gain more useful insights from the animal world. And thanks Nigel, for the big meerkat from Cambridge, England who is now a proud member of the meerkat family here in Vancouver. We are a happy family! The #lrnchat conducted on 21 May 2015 was a blazing round of thoughts, opinions, and views on 'Authority and Expertise'. An expert is someone who has sufficient experience and knowledge in a field to be able to recognize novel patterns from noise. Or, more abstractly, it's the ability to collapse possibilities of a topic/domain to their most salient in order to decide/act meaningfully. Scientists have debunked that 10,000 hours of practice does not make you an expert. So, if it is not practice, what is it that makes someone an expert? 2) They have valuable experience. 3) They are able to communicate their expertise. 4) They are connected to other experts. 5) They are humble about their expertise. 6) They are continuous learners. 7) They like to share their knowledge and wisdom. 8) They know the limitations of their own knowledge. 9) They have contributed to their field/area of expertise. 10) They are acknowledged as experts by others including their peers. This old post by Lorelle Vanfossen, What gives you the right to tell me? highlights some of the key issues we had discussed during the #lrnchat and makes for a great reading. Lorelle says: "What you know is important, but how you use what you know, and plowing the path rather than following behind, makes the difference in defining an expert." In this HBR podcast called 'Learning what wiser workers know', Dorothy Leonard, author of Critical Knowledge Transfer ​and Harvard Business School professor talks about retaining organizational expertise. While the focus of the conversation is about the need to transfer organizational knowledge and the tools and processes to do so, the definition of expertise is worth pondering about especially as it relates to an expert being open to sharing, being humble, and being a lifelong learner. Central Intelligence Agency (CIA), as one would understand to be, is a world of experts. So, how do they define expertise? In a book published by Center for the Study of Intelligence, 'Analytic Culture in the U.S. Intelligence Community', the author, Dr. Rob Johnston, says: "Expertise is commitment coupled with creativity. By this, I mean the commitment of time, energy, and resources to a relatively narrow field of study and the creative energy necessary to generate new knowledge in that field. It takes a great deal of time and regular exposure to a large number of cases to become an expert." He goes on to say, "Experts are individuals with specialized knowledge suited to perform the specific tasks for which they are trained, but that expertise does not necessarily transfer to other domains." There are other paradoxes to expertise and sometimes being an expert can be a weakness. From the same book, "Although one would expect experts to be good forecasters, they are not particularly good at it. Researchers have been testing the ability of experts to make forecasts since the 1930s. The performance of experts has been tested against Bayesian probabilities to determine if they are better at making predictions than simple statistical models. Seventy years later, after more than 200 hundred experiments in different domains, it is clear that the answer is no." Perhaps, this is where establishing teams of experts that offer more balanced expertise comes into play. But good teamwork and establishing collective intelligence is a challenge for another day. It seems that my study on this topic has just started. And in the journey of exploring various perspectives, I have taken the recommendation by George Siemens and got myself a copy of "The Cambridge Handbook of Expertise and Expert Performance". Monday mornings are Freakonomics podcast days. This morning, I heard the most interesting and inspiring podcast. The host, Stephen J. Dubner took me along on a magic show and then Steve Levitt spoke about 'The bagel man' and about loving ants. The podcast was titled, 'Think like a child'. It talked about how kids ask so many questions, how they are able to observe everything, and how they think out of the box to solve problems. Many ideas discussed in the podcast took me back to my old blog post, 'What children can teach us about learning' and how their curiosity and observation helps them learn so many things so quickly. "Enjoying what you do, loving what you do is such a completely unfair advantage to anyone you are competing with who does it for a job." I love my job and love doing what I do. So, I do believe I have an unfair advantage over someone who thinks being a learning consultant is just a job. To add to this powerful idea, here's something more. Not from the podcast but a related idea. Ron Culberson talks about his two step approach to success: do it well and make it fun. This totally makes sense. It you don't do your job well, just having fun at it won't cut it. For humor to work, you need to be excellent at work. In this article, Ron shares some of his tips on what if you can't find a job that you are excited about. Do you have an unfair advantage? Are you in a job that you are excited about? Do you #loveyourwork? I participate in the weekly #lrnchat and this is how the moderators open the chat. This deceptively simple question is perhaps the most challenging question to answer. It is a question that makes me think and forces me to reflect on the day. It has taken me some time but this question has now become a habit and is an important aspect of my daily reflection ritual. It is a way of figuring out how the previous day went for me and whether any of the activities I did and the interactions I had with people made it to my 'learned' list. I also use this question as a way to filter the most and the least effective activities in my previous day and prioritize my energy for the current day. When you start asking this question to yourself, initially, you may only be able to list the big learning moments. For example, conscious learning activities like learning a new software, reading an article and learning some new fact about wines, or learning how to fix a toaster might make it to your list. Gradually, you will be able to see many smaller learning events that surround you and are a part of your daily activities at work and at home. Some of these events may be unplanned and almost seem accidental. They may not be very obvious but are extremely useful. For example, troubleshooting some issue with your laptop or having an interaction with a co-worker only to find out that they know how to fix that exact problem in your laptop! After I started asking myself this question consciously, I was quite surprised at the kind of learning experiences I went through in a single day. I would say that there are as many opportunities to learn as the number of minutes you are awake! But knowing what you learned today is not enough. The idea is to be able to reflect on the learning process and identify what made you learn or why did you learn, how did you learn, what helped you learn, and how you can apply the learning in the future. We all are continuously learning in one way or another. But the difference between people who are more effective at what they do is that they utilize reflective practices to identify their learning and know how to apply and implement the learning in other situations. As a learning designer, I can't overemphasize the importance of reflection when designing adult learning (more about my tips on designing reflective practices in a learning intervention in another blog post). On a personal level, I have often used this question with my daughter to hear more about what she learned at school. I have noticed a big difference in her responses when I ask 'How was school today?' versus 'What did you learn today?'. I have tried this experiment several times and have received qualitatively different responses for these two questions. The answer to the 'how' question mostly ends up in monosyllables - good, ok, usual, etc. Then, I have to ask several probing questions to get some information. The 'what' question always brings forth interesting details about what she did in class and what she really learned. Give it a try. Final thoughts: you need not be taught for you to learn and not all teaching leads to learning! So, what did you learn today? Instructional Problem: What would I do in this situation? In my twitter feed, I saw a question for the #lrnchat community. The question was 'What would you do in this situation? To read about the situation, click here. This problem is as real as it gets. It is not a unique, course-specific, client-specific, SME-specific, ID-specific issue. Infact, this situation correctly defines the problem being faced by many reflective instructional designers, educated clients and smart learners. I don’t know the complete situation and by no means do I claim to be the expert here. However, this question did make me think. Analyse: Spend some time doing analysis before jumping into 'fixing' the course. Reconfirm the need for the course, why it is important, how it will be used, who will use it, etc. Be sure that the 'course' is the right way to close the learning gap. If not, step away from the job and don't create the course or fix the existing course. Talk to learners: Talk to the learners to identify how the course is relevant to them and how they plan to use the information from the course. Be sure to understand the learning context. Focus on the vital: Use the 80/20 Pareto principle and identify the vital few, the most critical learning objectives. Draft these learning objectives. These will be the 20% that make the most difference and are directly tied into 80% of the real-world performance tasks. Focus on what learners need to do: Use the 20% objectives to focus on what the learners need to 'do' and using that filter, remove what learners need to 'know' or things that are 'nice to know'. Revise content and media: For this 20% course content (which is now roughly down to 2 modules), revise the existing content or rewrite new content, if required. Create suitable media as required. Relevant content is the best way to ensure interactivity and engagement. Think outside the PPT: Remind yourself that using PPT slides is not the only way to deliver the training. Think about other interactive and engaging methods to deliver the training with not too much content writing yet ensuring maximum impact. For example, leverage SME time to build scenarios or role-plays that can be used during the course so that learners get to practice their new skills and receive feedback from experts. Use blended learning: Work with the client to build sessions by guest speakers or experts within the organization who can share stories or anecdotes related to the content area and how it is applied on-the-job. Make the course 'blended' so that learners can engage with both the content and the delivery media. Make learners pull content: Create a course where the learners can 'pull' more content when they need it. Don't write everything they should read or they should know. Create a framework for learning and support it by providing references, additional reading material, books, videos, etc. If they have a question, learners should know where to go or whom to speak to. So, that’s what I would like to do in such a situation. I do realize that projects and clients don't always go the way we would like to. However, as long as we are committed to designing and developing the best learning for our learners, we know that we are doing our bit to solve the problem. 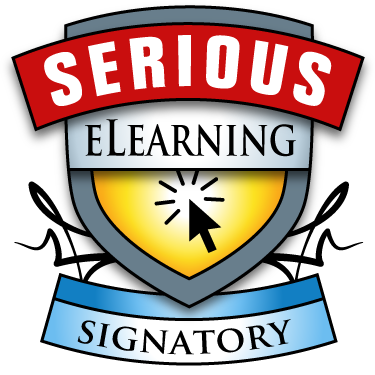 For some great advice on what makes quality instruction and valuable learning experiences, visit Serious eLearning Manifesto. If you agree, show your support!